We had never been to this wilderness before. We knew little of what to expect beyond tidbits of information online, in books and maps. It is the Blue Range Primitive Area in far eastern Arizona and consists of over 174,000 acres of rugged and raw country. The draw was Hannah Hot Springs; an isolated 133-degree hot spring in a narrow canyon in the middle of the Blue Range Primitive Area, 20 miles from the nearest civilization. The approach began with a 13-mile drive on dirt road from New Mexico. We parked literally on the New Mexico side of its border with Arizona and crossed into our home state with a sign indicating “ENTER ARIZ” on a barbed wire fence. Under stormy but dry skies, four miles of trailless navigation over mesas and through dry washes brought us to the head of Hannah Canyon. 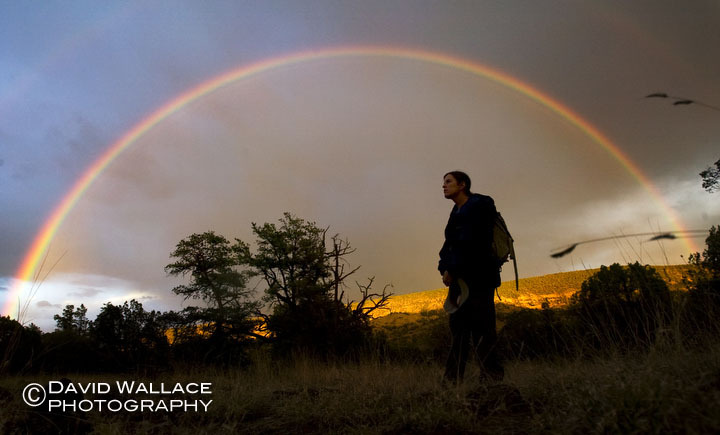 We set up camp for the night on top of the rim above the canyon and before nightfall were treated to a massive full rainbow that spanned the entire valley. The next day we made our made way down Hannah Canyon. After three miles of relatively easy travel the canyon narrowed up and we were faced with a number of down climbs and full on swimmers. There were no rappels but the difficultness of the down climbs was unexpected and was compounded by the fact that we were joined by our 20-pound dog, Briscoe. Assisting Briscoe with the climbs and swims we finally made it to the hot springs. The hot water was welcome relief after the cold swims, especially for Briscoe, but with temperatures in the upper 80s and the catch basin of the hot springs in the full sun, dunks in the cold pools were necessary between soaks in the hot bath. Our return route to camp included ascending two different conjoined canyons, one of which featured an amazing section of conglomerate narrows with logs wedged into the walls 25 feet off the ground, demonstrating the power of the flash food. Continuing we climbed up and over a mesa covered in surreal rock before dropping back into Hannah Canyon. That night in camp a full rainbow resembling the one from the night before appeared in the exact same location as the earlier rainbow. The next morning with a sun bleached cow’s skull we left this new and exciting wilderness. At the start of our hike we crossed from New Mexico to Arizona. A full rainbow as seen from our camp. The glow of the setting sun against stormy clouds looked like the forest was burning. Laura and Briscoe cross a pool in Hannah Canyon. Laura and Briscoe in the inner sanctum of Hannah Canyon. David and Briscoe under a massive log jammed into the canyon walls. David soaks in Hannah Hot Springs. David and Briscoe walk though the “Little Blue Box”. Layers of logs jammed into the canyon up to 25 feet high demonstrate the power of the flash flood. Canyons below, big sky above. Briscoe next to a cow’s skull that became a souvenir of the trip. Don’t suppose you have a GPS tracklog to the spring? We’re heading there this weekend….